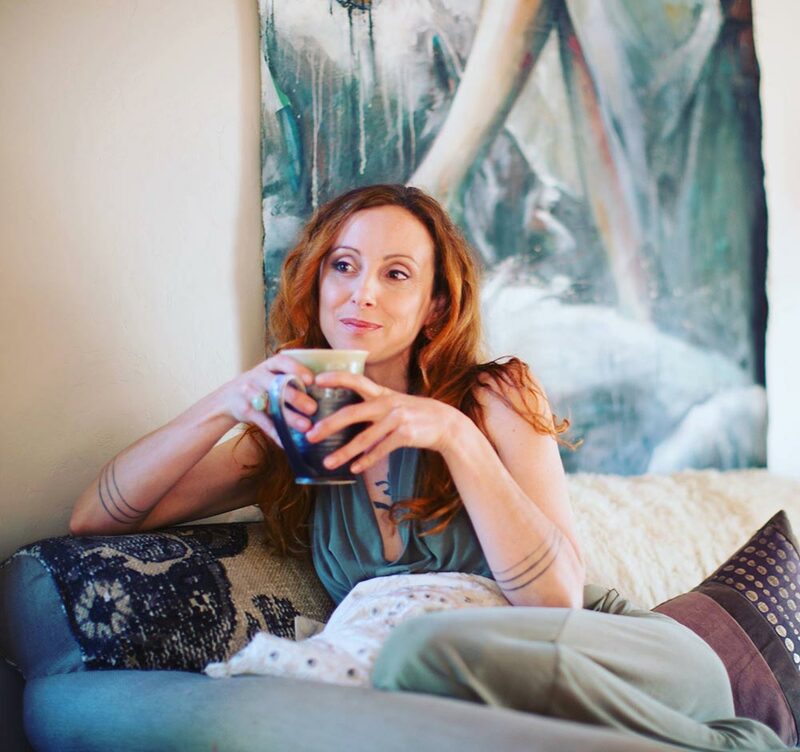 Darrah Danielle Ananda is a multi-dimensional artist, poet, yogini, beauty-weaver and lover of wild places. Ethereal by nature and refreshingly unconventional, she tends to choose the path less travelled. Early on, in the midst of chaos and trauma, she found home wandering in the fields and forests of childhood; conjuring make-believe with her animal companions by her side or trailing along single file behind her through the tall Summer grasses. There, in that Place of Possibility, she came to dwell when the outside world became too harsh and overwhelming. Some time later, she studied Creative Writing and received a degree in Literature from Penn State University before migrating back to the West Coast where the study of herbalism led her to settle in the mountains of Ashland, Oregon for seven years. There she traversed the lush moss green forests of the Northwest, re-wilding, dream crafting and delving into the exploration of various mixed media and performance art forms. During this chapter, she also worked for a small publishing company and a thriving independent bookstore, which nurtured her appreciation of the narrative form and fascination with storytelling that still permeates her visual work. However, it was when she discovered the work of surrealists such as German Dadaist, Hannah Hoch, and, later, contemporary Kenyan artist, Wangechi Mutu, that she finally felt a keen validation of the medium of collage and photomontage. This was a turning point when she gave herself permission to fully express in this way. After migrating to Los Angeles in 2004, she lived and created in an artist-in-residence-community where she met the legendary painter, Llyn Foulkes, who would become a dear friend and mentor. He inspired her to find, and ultimately, to trust, that voice that was authentically her own. He also sparked an invitation to greater dimensionality in her work as well as the incorporation of more organic found materials. She began to exhibit at artwalks, group shows and fundraisers during this time, culminating in her first solo show in Downtown LA in 2007. After many years of creative exploration and collaboration in the teeming heart of the city, including an enchanted interval at The Treehouse in Laurel Canyon, she heeded the call to return to country life in the North. Over many moons now, Darrah has been evolving herself through the practice of Creativity as Communion, channeling dream totems and symbols of the psyche into tangible signposts. Her mythopoetic found fables are hand-woven collage vignettes that inspire the imagination and ignite the heart. She currently lives in Northern California among the vanishing apple orchards with her beloved wolf-bears and feline familiars.